I did it once with Chanel Holographic but I made a quick comp with one of its dupes so there was a point to the post LOL. Anyway, today I"m showing you MAC Baby Goth Girl from the Fall 2009 Style Black collection and there's a story behind it. You're probably already familiar with "dusty hunting", basically it's going to small independant beauty retailers and nail salons and looking through their stock in order to find long gone HTFs. 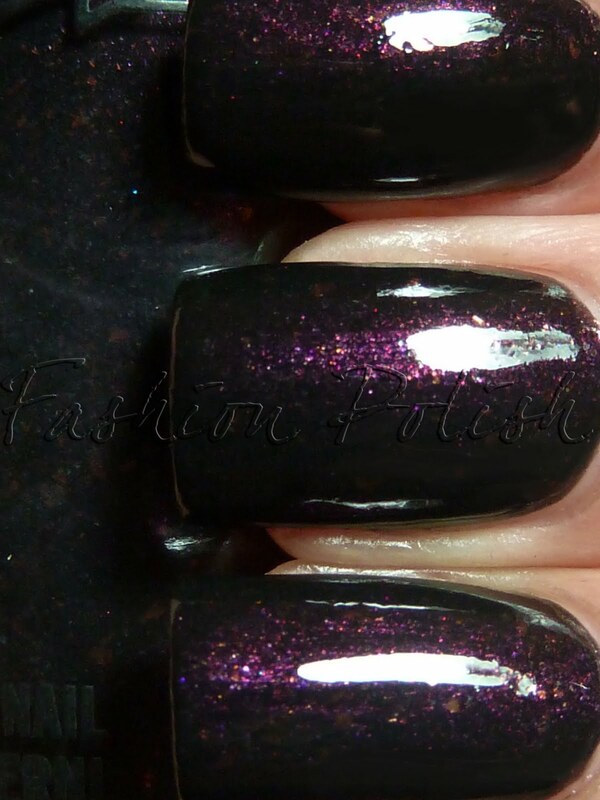 MAC Baby Goth Girl is a blackened base with tons of purple shimmer, leaning to plum, and orange flakies. It's a vampy for sure and I had no issue whatsoever with application, 2 nice and easy coats to achieve all this dark shimmer awesomeness. The picture below are with both base and topcoat. I'd love to hear about your dusty huntings and drawer searches! I've only ordered drawer searches when I was desperate for certain products that were recently on shelves. I see it must be done more often! Does this look very similar to MAC Rain of Flowers? I've had RoF for months but haven't actually worn it yet. So.. I'm curious as to how you go about asking! I've never thought to do this and I didn't know they had such drawers! @Liz (Beauty Reductionista) Baby Goth Girl and Rain of Flowers are very different, ROF is on the blue side of blurple, really cool and with small flecks, BGG is very warm and has true flakies, much larger. @Rachel Marie Asking is just about daring, you have nothing to loose. You could try and ask nicely for a specific shade, the SAs usually go and check their drawers, if they say they don't have it without even checking, I usually insist a bit, after all their job is to help us buy their products. I'm that annoying LOL, but like I said there's always at least a few nail polishes they don't have on their shelves. Just get Wagon Trail! Far superior to Seriously Hip. Seriously. Congrats on your excellent find! Thanks for the drawer search tip too. I'm sure I know a few out-of-the-way places I could try that technique out. You've created a lemming -_- I want nowww! Oh yes!!! Drawer searching!!! I think I like that even more than dusty hunting, I never miss a chance to "annoy the heck out of the SAs" LOL, and you're so right, I always prove them wrong too. Especially when I'm shopping in a city I've never been before, or even abroad on holiday I make sure not to leave the store without some thorough drawer ransack. I must say that after I find treasure I always make sure to thank the SAs from the bottom of my heart (and tips of my fingers ;-)) and usually I am so thrilled that even the SAs get all excited about it. So even if sometimes the SAs get a little mad about my impertinence and persistence I let them know I am what they want... ONE VERY HAPPY CUSTOMER!!! 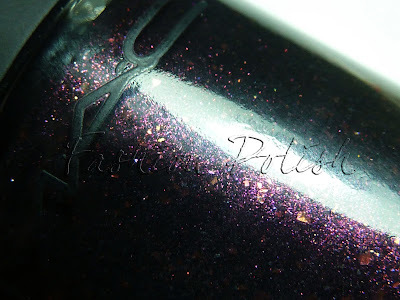 Great find Sam, love the vampy Baby, those flakies give it an incredible depth!!! Is it a jelly base? It reminds me a little bit of Trind CC134 and Koh Purple Universe. il est plein de promesses ! oh how I wish somewhere in my city sold MAC so I could start drawer searching! I have Baby Goth Girl, but it is untried... you are making me want to go put it on right now!! Beautiful! I didn't have any idea about this drawer! Nice to know. Very pretty polish. 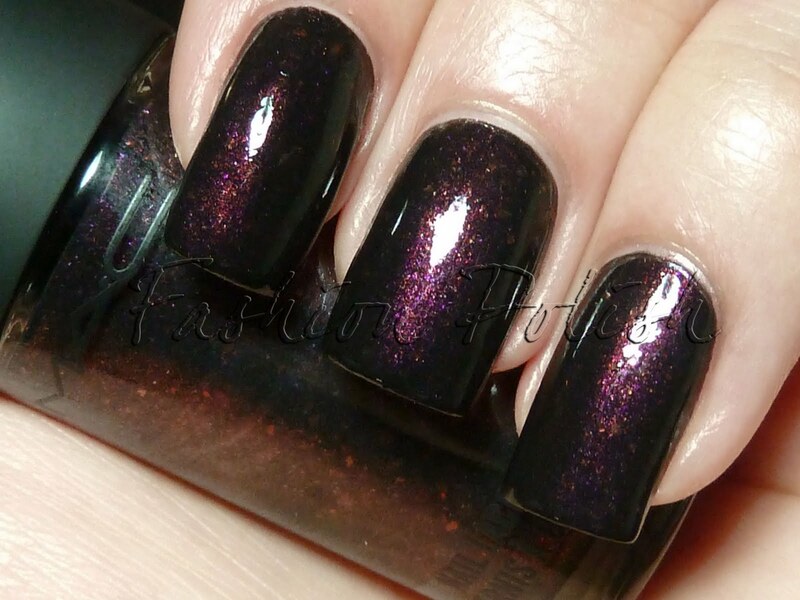 does anyone else think this looks a bit like sally hansen problem child (http://1.bp.blogspot.com/-bNXE2xbNoQc/Tcw2GIjj4dI/AAAAAAAADlI/5v0UENXSXG8/s1600/prochi+d.jpg)? wow, honestly it's never occurred to me to ask if they have any polish in a drawer that they don't have out! I mean, if I'm looking for a particular type of polish I'll ask sometimes (like flakies, they're SO HARD TO FIND here!) but now I think I may be asking at all the stores!